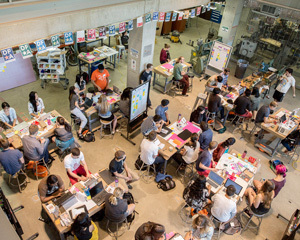 Seventy undergraduate students from 21 universities met at Northwestern from August 8-11 for this year’s Design for America (DFA) Leadership Studio. The largest DFA workshop to date, the event taught participants how to solve social issues with design thinking. The weekend kicked off on Friday with a visit from McCormick Dean Julio M. Ottino and Gordon and Carole Segal, who founded Crate and Barrel and endowed the Segal Design Institute. DFA is a grassroots, student-led network that began at Northwestern five years ago and spread across the nation to several universities, including Stanford, Massachusetts Institute of Technology (MIT), Cornell, and Yale. More than 400 students are now involved with DFA, where they are encouraged to assess social challenges using a human-centered design process and work collaboratively to implement solutions. At this year’s studio, students were challenged to embark on a 24-hour design project to gain hands-on experience in human-centered design by working with people affected by breast cancer. According to BreastCancer.org, one in eight women will develop invasive breast cancer within their lifetime. For each woman with breast cancer, there are dozens of family members, friends, caregivers, and physicians who are also affected. Teams presented their solutions on Saturday at a pitch expo attended by business professionals and DFA staff and alumni. The panel included Matthew Levatich (MMM ’94), president of Harley Davidson. One team presented “Supported,” a clothing line that promotes empowerment and beauty in asymmetry. The line includes lingerie for breast cancer survivors and apparel for their friends and family members. Another team pitched “Mammovan,” a mobile breast cancer screening service that provides accessible mammograms and health education to underserved neighborhoods. On Monday, DFA participants trained local nonprofit groups in design thinking. Teams took what they learned throughout the weekend and delivered two-hour design-thinking workshops to 12 local nonprofit organizations, including the McGaw YMCA, Best Buddies, and the Legal Assistance Foundation of Metropolitan Chicago.